I just recently had the opportunity to review the amazing window chalk markers from Vellostar. 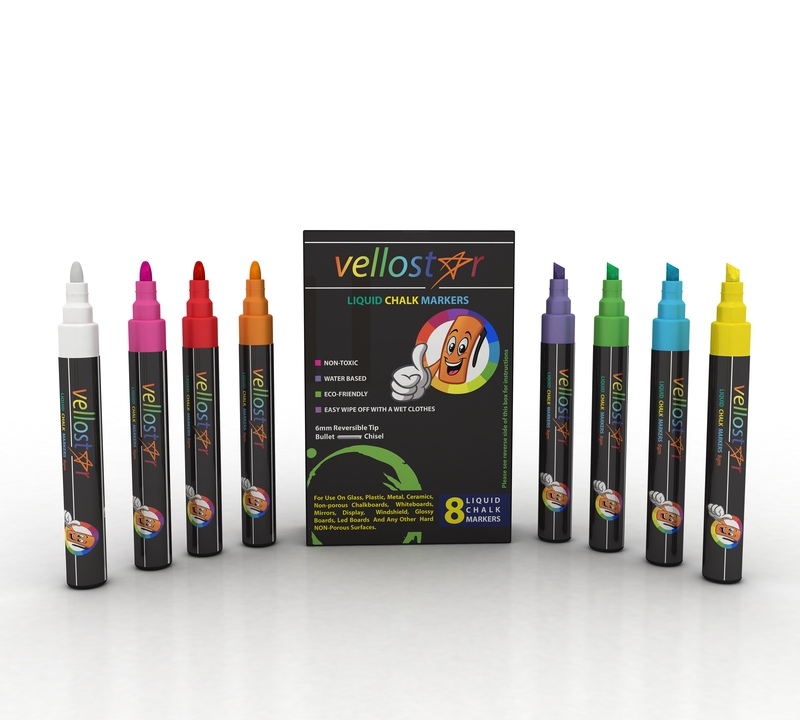 This is a great set of liquid chalk markers that can be used for a variety of things. The set comes with eight colors (white, yellow, orange, pink, red, purple, green, and blue). The markers are a great product, they are liquid chalk so you can smoothly and easily write on several surfaces. You will need to give it a few minutes to dry but then once it’s dry it’s like any other chalk. You can easily just wipe it off as well. You can use them on chalkboards, paper, plastics, glass, and other non-porous surfaces as well. Really easy to use. Just shake them, to get it started you will need to press down on the tip several times to get the ink to come down to the tip of the marker, and then just write like you would with a normal pen. I love using these for crafting projects myself. I love to get chalkboard paint or labels and use these to make some really cute decorative containers or jars. They are also really fun to use on the glass in the car, house, or office to write a fun message or draw a cute scene. My six year old loves playing with these as well. The best part is that they just wash right off. So I don’t have to worry to much about what she’s writing on.